At Cheer Zone we offer a wide variety of cheer training classes for all ages. Want to get involved in cheerleading but aren’t sure you’re ready for the Extreme Team. Sideline Cheerleading is a great option! Confused by all the hype and talk about all-stars? Cheerleading is competitive and many like to talk about other teams. At Cheer Zone, we are here to talk about what we know and that's our program. Come in and check it out yourself! Call, e-mail, or come in to schedule to attend a practice or class before you decide. You can meet and work with the staff, get a tour of our facility, view tapes of performances, talk to other parents, and more. Our staff will work with you to find the right cheer team for your needs. There are teams for beginners through advanced skills and our staff will help you take your skills to the next level. Our staff will also work with you to find the team that fits your commitment and financial needs. We have non-travel and travel teams. We will help you find the one that is right for you because we want you to be happy with being a part of our cheer family. We are confident that you will find our program to be incredible. At Cheer Zone we offer a wide variety of training classes for all ages. Our class instructional program is known for the high quality and enthusiasm of its instructors. Our staff can help cheerleaders reach their personal best. Cheerleaders and parents are welcome to observe any of our classes prior to signing up. Cheer Zone and the Gym have teamed up to introduce a new cheerleading program. Here’s how it works. Practice at Cheer Zone once a week for four weeks. Perform at one basketball game per month at The Gym. That’s it! This will give the girls an opportunity to showcase the great sideline cheers, jumps, and dances they will learn during practice, and also enable them to showcase their talents for loving family and spectators. This cheerleading class will teach sharp motions, voice inflection, jumps, and sideline cheers. The students will also work on tumbling. This cheerleading class will teach motions, voice inflection, jumps, sideline cheers, and floor cheers. Students will begin learning some basic mounting procedures. They will also work on tumbling. We invite all girls and boys to join our competitive cheer program. Every cheerleader is placed on a team. Our teams are based on age, and ability such as stunting, tumbling, jumps, cheer motions, etc. Each cheerleader is evaluated to ensure proper placement. For more detailed information, talk to your instructor, stop by the front desk, or call 757-ZONE (9663). Home of the Cheer Zone All-Stars. Where Competitive Athletes Train To Become State & National Champions! Cheer Zone not only produces top level athletes, but provides a positive and memorable journey along the way. 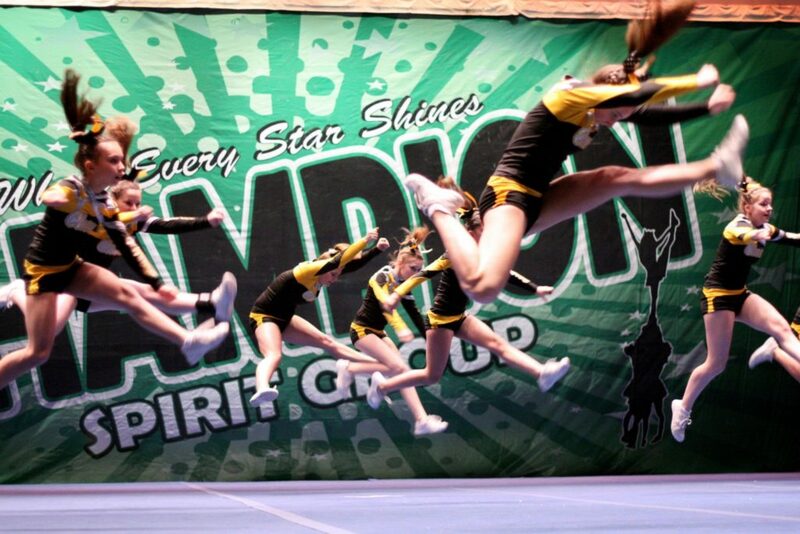 We offer both competitive and recreational cheerleading! Come join a family of over 100 of the best athletes in and around Springfield.